Caterpillars are the larvae of butterflies and moths, which belong to the order Lepidoptera. Many caterpillars, while they do feed on leaves and plants, are considered desirable because, of course, they metamorphose into beautiful monarch butterflies, painted lady moths, and other decorative species. Sawfly larvae look similar to caterpillars, but are an entirely different kind of insect. Sawflies are related to bees and wasps, and belong to the order Hymenoptera. 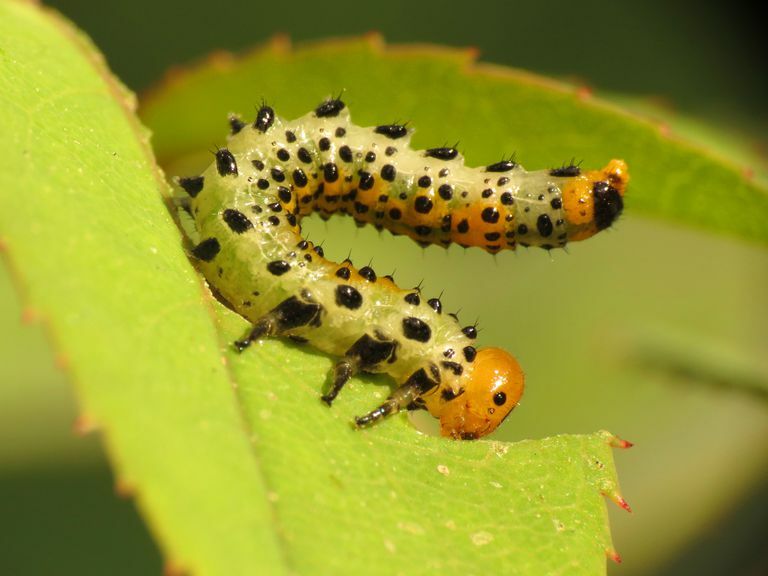 Like caterpillars, sawfly larvae usually feed on plant foliage, but unlike most caterpillars sawfly larvae can quickly destroy a rose garden or defoliate an entire tree. Sawflies are flying insects that live all over the world. There are more than 8,000 species of sawflies, so called because of the saw-like appearance of the female ovipositor, an organ used to deposit eggs in plant stems or leaves. While sawflies are related to stinging insects, they themselves do not sting. They feed on pollen and nectar, making them harmless to both people and plants. Sawfly eggs hatch into larvae which go through eight stages of growth. Typically, the larvae cluster together and are capable of eating an enormous amount of plant matter in a very short time. While sawflies are food for many animals in the wild, in cultivated areas they can be hard to manage. 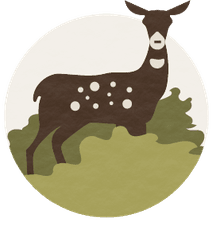 Sawfly management usually involves the use of chemical sprays. Sprays that work against caterpillars, however, are often ineffective against sawfly larvae. In addition, chemical sprays don't prevent sawflies from depositing their larvae. Chemical sprays should only be used when larvae are actually present. How Can You Tell Sawfly Larvae From Caterpillars? Caterpillars may have up to five pairs of abdominal prolegs (tiny limbs) but never have more than five pairs. Sawfly larvae will have six or more pairs of abdominal prolegs. There are, of course, exceptions to every rule. Caterpillars of the family Megalopygidae, the flannel moths, are unusual in having 7 pairs of prolegs (2 more pairs than any other Lepidopteran larvae). Some sawfly larvae are stem borers or leaf miners; these larvae may have no prolegs at all. Another notable difference, though it requires a closer look, is that caterpillars have tiny hooks called crochets, on the ends of their prolegs. Sawflies do not have crochets. Another, less obvious difference between caterpillars and sawfly larvae is the number of eyes. Caterpillars almost always have 12 stemmata, six on each side of the head. Sawfly larvae usually have just a single pair of stemmata. If you have identified sawfly larvae on your trees, flowers, or foliage you may be able to simply remove them manually. If there are too many, you'll probably need to spray. Choose your pesticide carefully or consult a professional: quite a few common pesticides (such as the bacteria Bacillus thuringiensis) work only on Lepidopteran larvae, and will not affect sawfly larvae. Before you apply any pesticide for a caterpillar problem, be sure to count the prolegs and identify your pest correctly.